I’ve usually done red velvet on cupcakes and all but not that often on cakes. So what is a Red Velvet ? It’s a cross between a butter and chocolate cake that is deep red in colour. But prominently, it taste like like chocolate cake because of the addition of cocoa powder. James Beard‘s 1972 reference American Cookery describes three red velvet cakes varying in the amounts of shortening and butter. All use red food coloring, but the reaction of acidic vinegar and buttermilk tends to better reveal the red anthocyanin in the cocoa. Before more alkaline “Dutch Processed” cocoa was widely available, the red color would have been more pronounced. This natural tinting may have been the source for the name “Red Velvet” as well as “Devil’s Food” and similar names for chocolate cakes. Yup so it does turn red, but red food colouring are used instead. Beetroot may work but I’m not entirely sure how much beet you have to use. 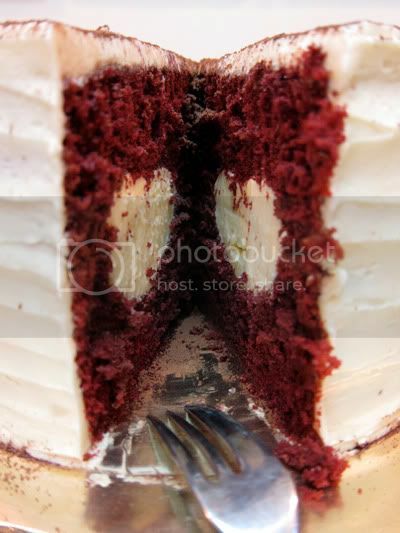 Red Velvet traditionally are paired with roux frosting ( a cooked flour based frosting) or nowadays to avoid cooking and to make life more simple, cream cheese frosting can be used to pair this reddish cake! 1. Preheat oven to 170 C. Line pans with parchment paper. In this cake, I used the Wilton Heart Tasty-Fill Cake Pan to create the heart shape effect in the center of the cake. If you’re using this, just grease the pan, generously. 2. Cream butter and sugar in a mixing bowl till light and fluffy. 4. Sift Flour, Cocoa Powder and Salt in a bowl. Set aside. Mix yogurt and milk together in another bowl. Add 1/3 amount of dry ingredients into batter, stir. Then add in 1/2 of wet ingredients, stir. Continue till all has finished. 5. In a small bowl, mix baking soda and white vinegar (This has to be done last) Add into the batter and mix well. 6. Pour batter into cake pan and bake for 30-45 mins (for Wilton Heart Tasty-Fill Cake Pan) or 45-55 mins for a whole cake pan. The idea is the shallower your pan, the shorter the baking time. If making on cupcakes, Bake for approx 20 minutes only or till skewer comes out clean. 1. In a saucepan, mix caster sugar, flour, salt and milk and stir till no visible lumps of flour. Cook over medium heat and stir constantly till thickens up like glue. It will usually take about 3-5 minutes. 2. Remove from heat and pour mixture into mixing bowl. Cool down to room temperature by beating the mixture at medium speed. Or cover with cling film and leave it in a pan to cool down but it takes a pretty long time. 3. Once mixture has cooled down, beat in butter pieces. * Butter pieces have to be very cold to prevent frosting from melting too quickly. Add in the rest of butter, then lastly, the vanilla essence. 4. Ice cake ask needed! looks very pretty. I like the white centre. I prefer cream cheese frosting coz it can taste pretty plain otherwise. cheers. thanks for the recipe. lovely. by the way, what color it will be if i wan to omit the colouring?! it turns chocolate? 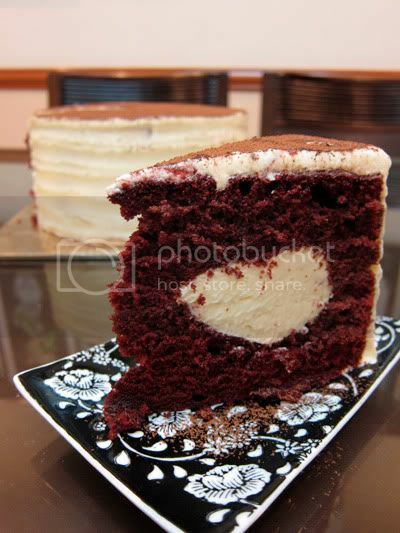 Swee San, I have been thinking to try this red velvet cake, will try this out soon. I will try using paper cups instead and cut to half portion, this seem is a big cake! Whoa! Your cake just blew me away! It looks really gorgeous! Have been tinkering with the red velvet cake idea, too! It's a favorite in the U.S.! But the red coloring scares me … Gimme time to rethink … Maybe I'll change my mind … Thanks for sharing the recipe! Btw, where are all your savory dishes!!?? Only saw this on the net, countless times. Geez … I'm so gonna get my piece soon. J2Kfm, yeah Daily Grind has it but I haven't tried it there .. I'm sure its good too ..
wow! it looks so amazing! just stumbled on ur blog and i'm loving it!! !